On August 23, the Chinese Ambassador to the UK, Mr. Liu Xiaoming, published an article in the British 'Daily Telegraph', setting out the Chinese position with regard to the European Union and the recently-expressed China-EU commitment to a worldwide rules-based trading regime, as agreed at the recent China-EU summit meeting. It was a perfectly sensible statement where Ambassador Liu pointed out that "The EU has been China's largest trading partner for 14 consecutive years, and China is the EU's second- largest trading partner." 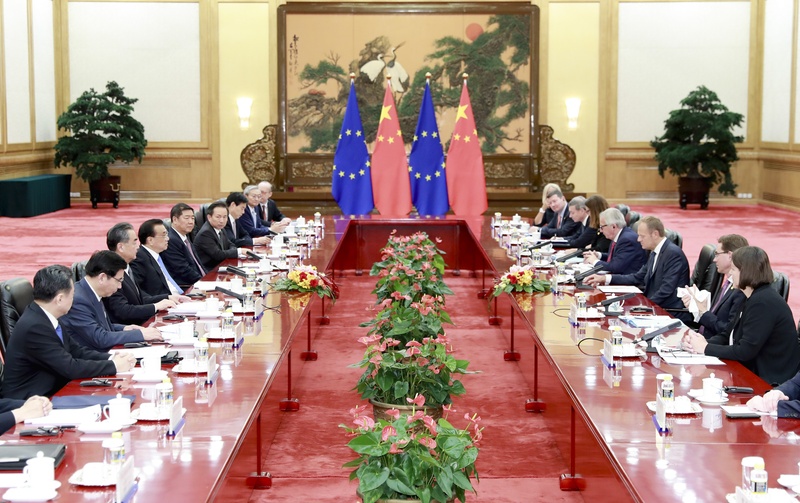 Ambassador Liu's statement also recalled the history of the relationship: "Trade and economic cooperation between China and the EU have grown rapidly thanks to the safeguard of the multilateral trade regime. Over the past 40 years, China-EU trade in goods has increased from less than $4 billion to more than $600 billion; trade in services has grown from zero to more than $100 billion; and the investment stock has soared from zero to nearly $200 billion". Much of this, of course, is due to the extraordinary economic rise of China since its launch of the reform and opening policy, but it is indubitable that China-Europe cooperation has played a larger and increasing part in the relations between the two regions. The Ambassador referred to the 20th China-EU Summit held in July, where both China and the European Union sent a clear message of upholding multilateralism and existing World Trade Organization (WTO) rules, and opposing protectionism and unilateralism. So, what was unusual about the Ambassador's statement? Of course, Ambassador Liu, as a very eminent Chinese diplomat respected around the world, has every right to set out his Government's position. But it cannot have been an accident that his comments were made in a country which is on the verge of leaving the EU, and in a newspaper, which is the mouthpiece of the conservative element in U.K. politics, and of those particularly who are in the forefront of the movement to ensure that 'Brexit' is successfully achieved. The Ambassador carefully avoided any reference to the British exit from the EU. This is in accordance with the well-established Chinese policy of non-interference in the affairs of other countries and groupings. Ambassador Liu's comments were aimed at the whole of Europe, whether Britain remains a part of its political and economic arrangements or not. But the 'global free trade' message, addressed by an Ambassador to the U.K. to a U.K. audience, must have had a certain barb to it. Chinese diplomacy never happens carelessly or by accident. There are protectionist elements in continental Europe, such as restrictions on Chinese investment, which are not present in the U.K. By addressing a free-trade message to the EU from the Chinese Embassy in London, China is making the point that if the other EU members do not follow the full free-trade agenda, then Britain will get ahead of them. This does not constitute Chinese interference in the growing dispute between the UK and the EU. Chinese trade policy is very clear and consistent, and Ambassador Liu's message is intended to make it clear that the only way to win is to go along with the global free trade agenda. China may not intend to interfere in the dispute between Britain and the EU, but she is certainly aware of it, and of the fact that the U.K., in leaving the EU, will be increasingly dependent on proper trading relations with the major non-European powers, such as China. There is absolutely no bias in Ambassador Liu's words, addressed to the question of EU-China relations as they have been for the last forty years, during all of which time Britain was a member of the EU: but now that Britain is about to leave, it makes sense for a message concerned with the importance of a properly free trading relationship between China and Europe to be issued from London. There is likely to be a trade war in Europe in the next few years, as the European Commission tries to punish the UK for its temerity in opting to leave the organization – if only to discourage other member nations from taking the same path. And the U.K. will certainly fight back, seeking other markets in the more distant parts of the world, using whatever historical connections at her disposal. China will not intervene in these differences, but will rather seek trade with whichever countries are prepared to trade on an open and equal basis. China has never traded with the EU as such, only with the member states; what arrangements those member states have chosen to make among themselves have been no business of China's. The rules-based global trading regime which China consistently supports takes no account of such things. If the other 27 EU members will not play along, Britain will. Or at least that is what Ambassador Liu hopes for. By addressing a free-trade message to the EU from the Chinese Embassy in London, China is making the point that if the other EU members do not follow the full free-trade agenda, then Britain will get ahead of them.